We talk to a group of visual effects artists to discover the most hip and happening places to work in the industry, find out why those hubs sprang up and look at key projects to come out of them. In this feature we talk to the team behind the visual effects of First Man, discovering how they recreated one of mankind's greatest achievements. Take a look at our massive Keyshot tips collection, where our top artists share their secrets to success. Precise modelling can be tricky in VR but in this issue Mike Griggs shows you how to use Gravity Sketch to create a stunning Akira styled scifi motorbike. In this tutorial our expert VR artist, Martin Nebelong, shows you how to make hard surface models in a VR project, expanding your skillset. 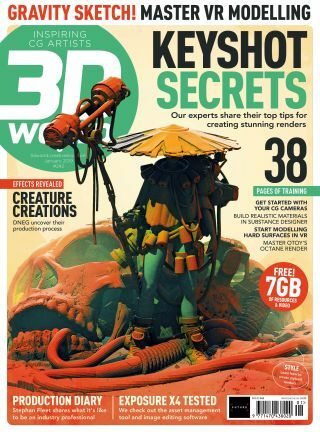 Buy issue 242 or subscribe to 3D World here.